Makes me think: there is a need for planning and aiming: sometimes leading a church feels a bit like nailing jelly to the ceiling, or trying to teach ravens to fly underwater (to paraphrase the late Peter Cook and Dudley Moore). I could plan and set goals better; it doesn’t really fire me and most times there just seems too much to deal with. …as the cartoon shows: taken to it’s nth degree, it is not what it is about is it? Show me the place with precise plans etc and I will show you the place where people can’t bleed or be messy and unpredictable, or where they cannot be who they are without pretence. …and maybe in worshipping that particular golden calf, it may be a place where God can’t dance freely …. My children follow YouTube channels or at least know where to look. Mostly I can’t understand what they are watching (Minecraft screen captures and films of blokes reading out Y’uogih (?) cards….). I suppose I reached that stage with my parents: your world is growing and expanding and your peer group is becoming more important in defining who you are. Nonetheless, I find it bittersweet: the excitement of seeing them build their own world coupled with intimations of my own mortality. (1) If you can’t enter into surreal, you are probably not breathing. (2)I wish I was nearly 10 again…. I shared this on my fb wall last week. I always like http://asbojesus.wordpress.com/ and wish he would post more often. This week I have mostly been ploughing through Matthew 5:17-20 which the church that I am going to on Sunday wants me to preach on. To be honest, it has felt a bit like the Dud n Pete sketch featuring Sir Arthur Streeb-Greebling: akin to teaching ravens to fly underwater. I wish I could read it a bit more instead of preaching it. On the basis that I like listening to the story, I have been reading the Sermon on the Mount… reading it is a shock and it put me in mind of the cartoon above: I mean, it is hardly a manifesto for success is it? Neither does it fulfil any SMART (specific, measurable, attainable, relevant and time-bound) criteria. I get to read and stay with the Bible in my job: mostly it is a real eye opener and akin to a hand grenade in a sweet shop- I understand less and less. And I am grateful for that…. I follow this site on Facebook: ‘Radio Free Babylon’. I like it: quirky- intentionally uses American 50s graphics and characters, but places a kind of ‘thought for the day’ on their lips. It is Christian but mostly not twee (believe me; google ‘Christian’ and ‘twee’- we seem to have the marketplace covered). I love how Jesus always looks the same: long hair, European, beard and usually a white nightie- although here he is intentionally like a Chief Exec. I read one this week, smiled and felt encouraged…. I have long appreciated his reverent/irreverent take on things. I really like this cartoon- the angry/puzzled face and the refusal to let go. I am involved in running a ‘Christianity Explored’ course. 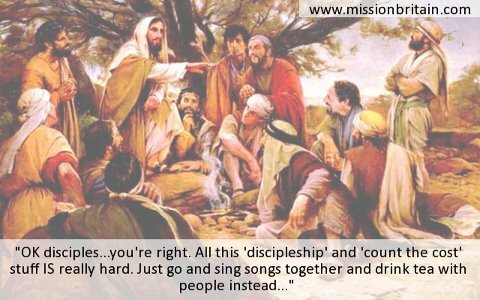 The best bits have been when people have read the Bible and started to get to grips with a Gospel…. instead of a knowledge of a ‘greatest hits’ Jesus listened to, dimly from the next room. It has been even better when those who don’t come near a church/rarely come or who have only recently arrived begin to read. It is so vivid and exciting…. more so when I let people talk and then just listen. I love the internet. I love the opportunity it gives to discover others who add to your own journey through life. I love the opportunity it gives to creatively engage with others who you may not always see eyes to eye with. I have followedhttp://www.nakedpastor.com/ for years. His journey has took him away from regular church. I don’t always agree with him, but he makes me think. This was a cartoon he posted a week or so back. If a picture says a 1000 words…. I am including this as a kind of commercial. Go over to http://www.nakedpastor.com/ and follow him! Why I don’t like Christian motivational stuff. I could put something here about ‘God must love you a lot to let you go through this’ or ‘Keep praising’ or any of the stock phrases used to avoid the darkness. That is not really my target: it is that wealth of Christian (mainly, but not exclusively, American evangelical) literature that ignores pain, income wealth/redistribution or the value of simply enduring. I could rant more, but the above satirical poster says more than I ever could. Author GrahamPosted on October 27, 2012 Categories cartoons, rant3 Comments on Why I don’t like Christian motivational stuff. Author GrahamPosted on July 21, 2012 Categories cartoonsLeave a comment on Indeed…. After this week’s course, I realise that social media has it’s downsides…. It is so true….The first 3 lines could be a life of Jesus….without the crucifixion. The whole could be a parable of a life following Jesus- you want to hold out and follow, but reality kicks in and you settle for a quiet life, hence the last two lines. I would dearly like to stay in the first 3 and find a group to provoke me and support me in staying….. I guess that is why there is such a thing as ‘church’…… although most often we feel most comfortable in line 6….